It is a common misconception that the responsibility for height safety is solely with the builder or building owner. However with regards to the design of a structure, Section 22 of the WHS Act 2011 states that if you are an architect, engineer or building design professional who works on the technical design of buildings you have an obligation to ensure "so far as is reasonably practicable, that the plant, substance or structure is designed to be without risks to the health and safety of persons". For more information go to Safe Work Australia's information page Safe Design. 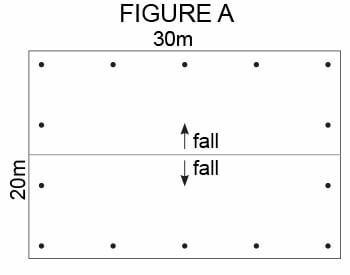 On a 5 degree pitched roof, which fall arrest anchor point layout is correct? 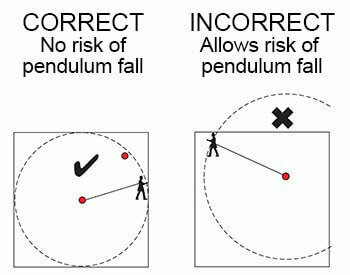 As you can see by the diagrams below, the correct anchor point positioning is imperative in preventing pendulum fall. It is also a requirement that the parapet structure is rated in accordance with the load ratings as specified in AS1657. According to the hierarchy of control, fall prevention is the highest form of protection. This removes the risk of the worker falling by providing a barrier between them and the fall hazard. Guardrails and skylight protectors are examples of the types of equipment that fall into this category. This method requires the least amount of operator competence for working at heights. For more clarification on the different categories of height safety equipment visit our article Fall prevention, fall restraint and fall arrest. Guardrails and skylight protectors are examples of the types of equipment that fall into the category of fall prevention. This method requires the least amount of operator competence for working at heights and according to the hierarchy of control is the highest form of protection you can provide. Thank you so much for taking our height safety knowledge quiz. Please complete the details below and click submit to see your results.